Le Méco could not enjoy a better spot. 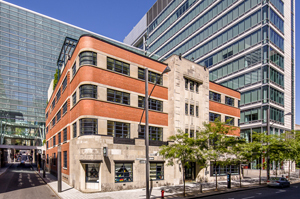 It is located at the heart of Montreal’s Quartier international (QIM), steps from the city’s business core, the Palais des Congrès convention centre, and Old Montreal. Its proximity and direct link to the Édifice Jacques-Parizeau and the vast underground pedestrian network undeniably constitute yet another advantage. The Art Deco inspired design imbues the building with elegant charm. Le Méco is ideal for professionals looking to grow their companies in an environment experiencing a true revival.